The Azerbaijan democratic republic is the first secular democratic state in the Islamic world. It was established on May 28, 1918, but did not last long. Then people of Azerbaijan got their independence once again after more than 70 years of struggle and sacrifice. In Azerbaijan, independence day is also known as the state of Sovereignty Day. Azerbaijan became part of the Soviet Union after almost two years of its first independence. On 30 August 1991, Azerbaijan made clear its intention to become an independent nation once again when parliament adopted the Declaration of the State Independence of the Republic of Azerbaijan. Soon, on 18 October 1991, the constitutional act of the state independence of the Republic of Azerbaijan was approved and adopted. In addition, when the Soviet Union officially ceased to exist, the act of independence was affirmed by a nationwide referendum on 29 December 1991. 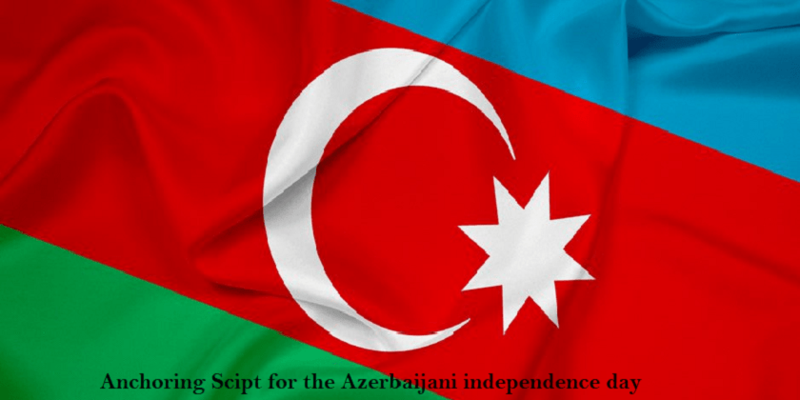 The anchoring script for the Azerbaijani independence day below can help you celebrate and host the program at your school or college. There are many ways you can start. For have a better start of your program, you need to keep in mind that you have to start in such a way so that you could grab your audiences’ attention as soon as possible. For that purpose, you should first examine the place, identifying your audience on the basis of their age and experience etc. Anchor 1: Ladies and gentlemen, our salutation and a warm welcome to you all: respected parents, honorable guests, esteemed principle, hardworking teachers, and dear students; today, we feel honored to be here celebrating the … years of independence along with you all. Anchor 2: So, we hope that as we step forward today, you yourself will discover the glory of this holy day tricolors of this flag. Anchor 1: History witnesses that our countrymen worked hard enough, risked their lives, burnt the midnight oil to bring back the smell of liberty in the air of Azerbaijan. A salute to those all Azerbaijanis. Anchor 2: May we think of the freedom, not as the right to do as we please, but as the opportunity to do right. Moving forward, ladies and gentlemen, we would like you to stand up for the national anthem. Anchor 1: Thank you, everyone. Anchor 1: It is time to call upon our cute little fairies who have worked so hard for a warm welcome to you all. So, put your hands together for them. Anchor 2: Wow, it’s an amazing heart-touching performance. Anchor 1: To appreciate them, once again, put your hands together. Anchor 2: We must be free not because we claim freedom but because we practice it. Anchor 1: And this nation will remain the land of the free as long as it is the home of the brave. Therefore, a salute to all those noblemen. And I would like to invite (name of the speaker) to share his views. Anchor 2: Thank you, (name of the speaker). Anchor 1: Now, we would like to call upon the person who made this possible to make sure quality education in this institute. So, please, out your hands together for him. Anchor 2: Thank you, sir. We appreciate your hard work and sincerity towards this institute. Anchor 1: Freedom in the mind. Ladies and gentlemen, it is our turn to give our contribution to the prosperity of our beloved country. Lastly, Happy independence day to you all and wish you all health, prosperity, peace, and love. I hope the Anchoring Script for the Azerbaijani Independence Day, was helpful for you. please, feel free to share your view in the comment section below.